So, what do you do when you have leftover roasted asparagus? Well, you could put it in an omelet the next morning for breakfast or brunch. Or, you could add it to pasta with a creamy mushroom sauce. Or, you could bake it into a casserole, puree it into a soup or mix it into a cheese sauce and use it to top baked potatoe. Or, you could toss it to a salad made of other sweet spring vegetables and fresh goat cheese then dress it with a simple vinaigrette, which is what I did for dinner last night. It went deliciously with the rest of our dinner–and I think that with the addition of some chopped up boiled egg and toasted black walnuts, it would make a great light lunch. 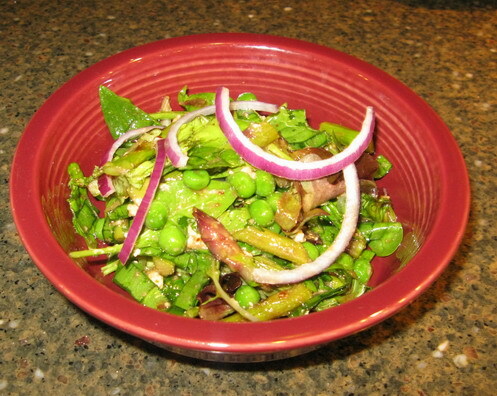 If only I had some leftover roasted beets to add to the salad–then it would have been perfect! 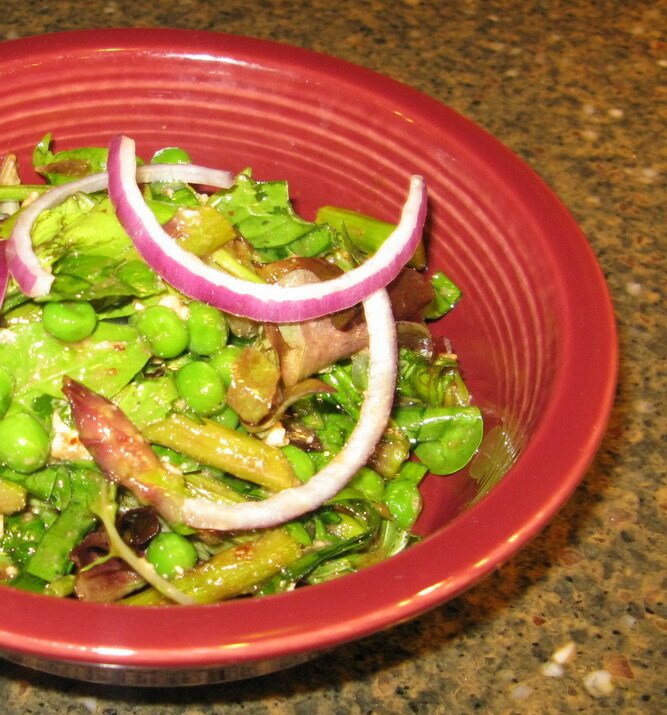 (Not only because the beets would taste great with the asparagus, peas, red onions and greens, but because the color would have looked amazing in the salad. The red onions brought out the reddish violet highlights in the tips of the asparagus spears, and I can only imagine that the rubine translucence of beets would have brought them out even more. 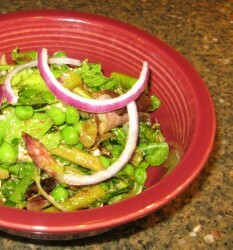 One thing about using leftover roasted asparagus–if you used a solid fat like ghee or butter to roast the vegetable, be certain to warm your asparagus slightly in the microwave in order to melt the fat that is clinging to the spears just before you add it to the salad and toss it with the dressing. Otherwise, you risk having globs of cold ghee or butter in your salad which is just not very appealing. If you used olive oil or canola oil–any oil that is liquid at room temperature, really–to roast your asparagus, you don’t need to worry about heat it up a bit before serving. Straight out of the fridge will work, though I think it tastes better if you bring it to room temperature before making the salad. 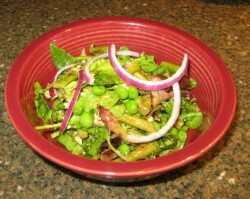 Toss the lettuces, spinach, peas, asparagus spears, onion, cheese and ramps in a large bowl. Whisk together the remaining ingredients until an emulsion is formed. Drizzle as much dressing as you like over your salad and toss to combine. It looks delightful, but I do not understand the concept of “leftover asparagus”.